Arlington County Police and the FBI are seeking a serial bank robber who robbed a bank on Columbia Pike Friday afternoon. 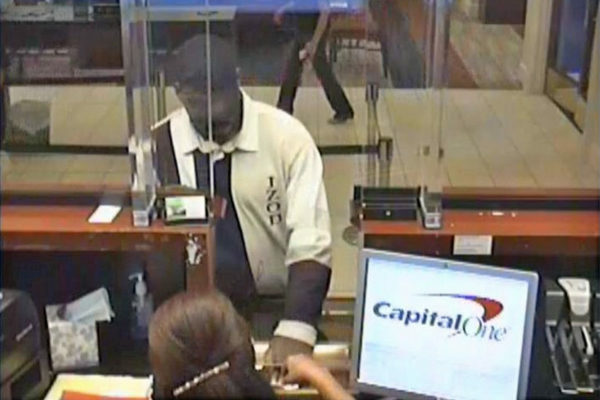 The suspect, dubbed the Forever Loyal Bandit by the FBI, passed a note to a teller at the Capital One Bank at 3532 Columbia Pike around 4 p.m. He received an undisclosed amount of cash and fled the scene. This was the fifth bank robbery perpetrated by the Forever Loyal Bandit since June 2014, the FBI said. The “Forever Loyal” name is a reference to a t-shirt worn by the suspect in two of his first three robberies, all of which occurred in Falls Church last summer. The suspect went dark after an Aug. 2014 robbery, then reappeared a week ago, on Oct. 30, when he robbed the Capital One Bank at Seven Corners Center, which he had also robbed last year. The suspect is described as a black male, between 6’0″ and 6’3″. He’s said to be in his 30s, 40s or 50s. During the Pike robbery, the man was wearing a black baseball hat, a white and black long-sleeved Izod polo shirt and black pants. The FBI is offering a $5,000 reward for information that leads to the identification, arrest and conviction of the Forever Loyal Bandit. Anyone with information is asked to call the FBI at 202-278-2000, or Crime Solvers at 1-866-411-TIPS (8477).